A new study in Science Advances by Wei Liu and colleagues at the Scripps Institution of Oceanography in San Diego and the University of Wisconsin-Madison has important implications for the future stability of the overturning circulation in the Atlantic Ocean. They applied a correction to the freshwater fluxes in the Atlantic, in order to better reproduce the salt concentration of ocean waters there. This correction changes the overall salt budget for the Atlantic, also changing the stability of the model’s ocean circulation in future climate change. The Atlantic ocean circulation is relatively stable in the uncorrected model, only declining by about 20% in response to a CO2 doubling, but in the corrected model version it breaks down completely in the centuries following a CO2 doubling, with dramatic consequences for the climate of the Northern Hemisphere. 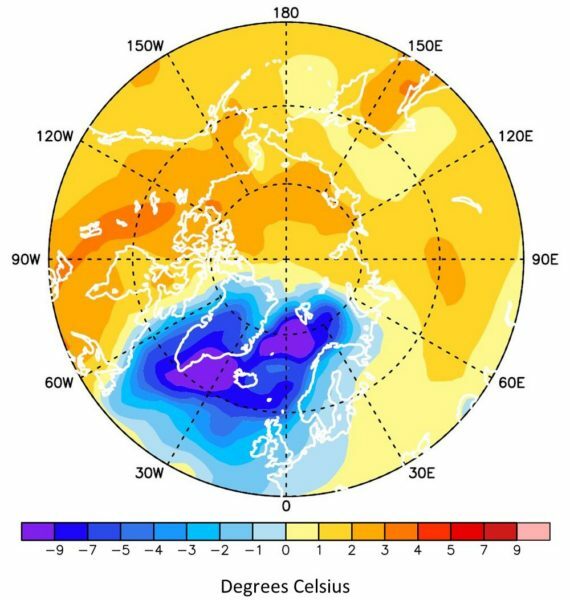 The potential instability of the Atlantic Meridional Overturning Circulation or AMOC – commonly known as the Gulf Stream System – has been a subject of research since the 1980s, when Wallace Broecker warned in an essay in Nature of Unpleasant Surprises in the Greenhouse. The reason for this was growing evidence of abrupt climate changes in the history of the Earth due to instability of Atlantic currents. Fig. 1 Schematic of the Atlantic ocean circulation (simplified). In red the relatively warm surface flow is seen, in blue the cold deep water flow. 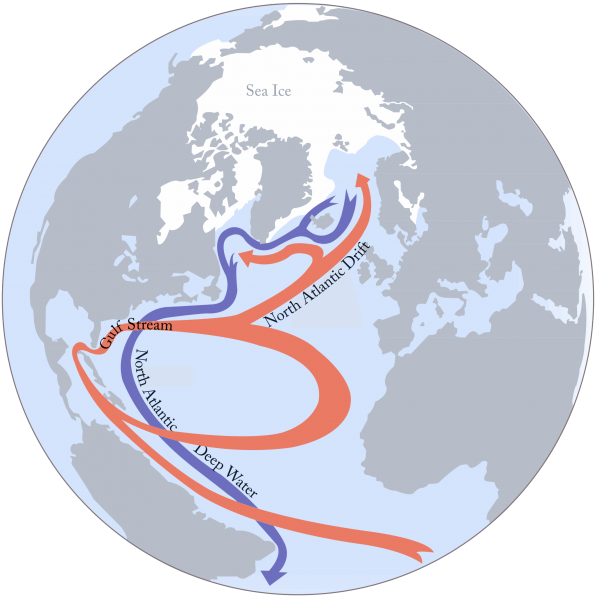 The northward surface flow and southward deep flow together make up the Atlantic Meridional Overturning Circulation (AMOC), popularly dubbed Gulf Stream System. Image by S. Rahmstorf (Nature 1997), Creative Commons BY-SA 4.0. The basic physical mechanism of this instability was already described by Henry Stommel in 1961. The freshwater balance (precipitation minus evaporation), which determines the salt content, is central to this. Freshwater continually flows into the northern Atlantic through precipitation, rivers and ice-melting. But supply of salty waters from the south, through the Gulf Stream System, balances this. If however the current slows, there is less salt supply, and the surface ocean gets less salty. This fresher water is lighter than saltier water and therefore cannot sink into the depths so easily. Since this sinking – the so-called deep water formation – drives the Gulf Stream System, the current continues to weaken. There is a critical point when this becomes an unstoppable vicious circle. This is one of the classic tipping points in the climate system. However, it’s still unclear where exactly this tipping point is. Most models show a significant slowdown in the Gulf Stream System by 20% to 50% in typical global warming scenarios up to the year 2100, but do not exceed the tipping point that would lead to its collapse. However, there is a large spread between different models – which is not surprising since the stability of the Atlantic flow depends on a subtle balance in the salinity and thus also in the freshwater budget, which is only inaccurately known. In addition, there have long been serious indications that the models are not only inaccurate, but perhaps all systematically biased towards an exceedingly stable AMOC. We discussed these papers in a review article in PNAS in 2009. What makes the new study different? According to lead author Wei Liu, the starting point of the new study was my paper from 1996 on the relationship between the freshwater balance and stability of the flow. Back then I showed how to determine the stability of the AMOC from an analysis of the freshwater transport in the Atlantic at 30° south. The decisive factor is whether the AMOC brings freshwater into the Atlantic basin or whether it exports it (in the latter case, working to increase salinity in the Atlantic). My article ended with the suggestion to clarify this from observational data. That was later done by colleagues from Holland (Weijer et al. 1999). Several studies followed which performed this diagnosis for different climate models (e.g., Pardaens et al. 2003, de Vries and Weber 2005, Dijkstra 2007, Drijfhout et al. 2010, Hawkins et al. 2011). According to the observational data, the AMOC is exporting freshwater, which is why freshwater will accumulate in the Atlantic when the AMOC breaks down. That is precisely the instability described by Stommel 1961 and Broecker 1987. In the models, on the other hand, the AMOC in most cases imports freshwater, so the flow is fundamentally stable there. The differences in AMOC stability between different models cannot be understood without the fundamental criterion of whether the AMOC imports or exports freshwater, and by what amount. Liu et al. 2014 have identified a known common bias in all coupled climate GCMs without flux adjustments, the “tropical bias”, which makes them import freshwater in contrast to what observations show for the real ocean. A model bias towards stability is also consistent with the fact that most models underestimate the cooling trend observed in the subpolar Atlantic, which is indicative of an ongoing significant AMOC weakening, as we have argued (Rahmstorf et al. 2015). The new study attempts to correct this model deficit by modifying the freshwater exchange at the sea surface in a model by using a so-called flux correction (which also involves the heat exchange, but this should be secondary). As a result, the salinity distribution in the ocean of the model for today’s climate is in better agreement with that of the real ocean. This is an important criterion: while precipitation and evaporation over the oceans are difficult to measure and therefore only very imprecisely known, we have detailed and precise information about the salinity distribution from ship measurements. Apart from the improved salinity distribution, this correction has no significant influence on the model climate for the present. With both model variants – with and without the subtle correction of the salinity distribution – an experiment was performed in which the amount of CO2 in the air was doubled. The reaction of the Atlantic circulation is shown in the following graph. Without correction, the AMOC once again proves to be very stable against the massive disturbance. With the correction, in contrast, the flow breaks down in the course of about 300 years. It has lost a third of its strength after 100 years. Fig. 2 Time series of the Atlantic flow (AMOC) in the two model variants: without correction (blue) and with correction (orange). In model year 201, the CO2 concentration in the model is doubled and then left at this level. Source: Liu et al., Science Advances 2016. As expected, the breakdown of the heat-bringing Gulf Stream System leads to a cooling in the northern Atlantic, as shown in Figure 3. Land areas are also affected: besides Greenland and Iceland mainly Great Britain and Scandinavia. Fig. 3 Temperature change in the winter months (DJF), 300 years after CO2 doubling in the experiment. Due to the almost completely extinct Atlantic flow, the northern Atlantic region has cooled significantly. Source: Wei Liu, with permission. Also, no meltwater influence from the dwindling continental ice on Greenland was taken into account, which could additionally weaken the flow. On this topic, only three weeks ago a new study was published (Bakker et al. 2016) comparing future warming scenarios, once with and once without consideration of the influx of Greenland meltwater. (An emulator was used for this study; that is a highly simplified computer model that reproduces the results of complex circulation models in a time-saving way, so that many experiments can be performed with it.) With unmitigated emissions (RCP8.5 scenario), the Gulf Stream System weakens on average by 37% by the year 2300 without Greenland melt. With Greenland meltwater this doubles to 74%. And a few months ago, a study with a high-resolution ocean model appeared, suggesting that the meltwater from Greenland is likely to weaken the AMOC considerably within a few decades (Böning et al. 2016 – as we reported). There are, therefore, two reasons why thus far we could have underestimated the risk of a breakdown of the Gulf Stream System. First, climate models probably have a systematic bias towards stable flow. Secondly, most of them do not take into account the melting ice of Greenland. As the new studies show, each of these factors alone can lead to a much stronger weakening of the Gulf Stream system. We now need to study how these two factors work together. I hope these worrying new results will encourage as many other research groups as possible to pursue this question with their own models!